For all your Pumping & Process Requirements - Pumps, Tanks, Vessels, Pipe Work etc.. 1/4 GRACO HUSKY 205 AIR DIAPHRAGM PUMP ATEX (polypropylene/PTFE) - D11021. Polypropylene Body, Seats & Valves. 1/4 Graco air driven double diaphragm pump. Wetted body construction in Polypropylene c/w PTFE diaphragms, valves & seals. Polypropylene centre body & internal air valve assembly (Non-stall, no oil design). Connections 1/4 x 1/4 NPT/BSP female. Maximum free flow on water 19 lpm. Graco Husky 1/4-inch pneumatic double diaphragm pumps offer true-formed PTFE and Santoprene diaphragms for enhanced performance and is available in polypropylene, groundable acetal and PVDF. Seal less design, no mechanical seals or pack glands. Lubrication free, non-stall easy to access air valve design. Completely pneumatically driven, no need for electric. Wide range of spares interchangeability, keeping down time & stock holdings to a minimum. Dry running capabilities, without causing long term damage to the pump. Inherent self priming design, ideal for emptying barrels, bulk containers, tanks and bunds. Variable flow range, from zero lpm to the pumps maximum design capacity. Easy to strip, assemble & maintain. Maximum Free Flow - Water. 18.9 lpm (5.0 US Gpm). 1/4 & 1/4 Inch NPT/BSP Female. 0.252 m3/min (9.0 scfm). Maximum Dry Suction Lift - Water. 2.5 metres (8 Feet). 1.5 mm (0.06 Inch). 0.0223 Litres (0.006 US Gallons). Typical Sound Level at 4.9 Bar (70 Psi). We also supply all other spare parts for all types of'Air Driven Double Diaphragm Pumps'. A VAT invoice shall for provided with every order. 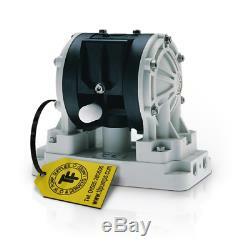 The item "1/4 Graco Husky 205 / AT06/VA06 Air Diaphragm Pump ATEX (poly/PTFE) D12091" is in sale since Tuesday, February 20, 2018. This item is in the category "Business, Office & Industrial\Hydraulics, Pneumatics, Pumps & Plumbing\Pumps & Pump Accessories\Vacuum Pumps\Diaphragm Pumps". The seller is "tfpumpsdirect" and is located in DERBY.